Hundreds of University of Miami alumni poured onto campus this week to celebrate Homecoming 2018, but some graduates don’t need an excuse to visit their alma mater. For the alumni who are now employees at the U, every week is homecoming week. Some alumni left the university after their undergraduate studies and returned later. Others began their education elsewhere, but chose to earn postgraduate degrees from UM. And some never left at all. Christopher Hartnett, who first began studying English literature at UM in 2000 and later earned a master’s degree in education, said the connection among the alumni has always been strong regardless of their varied backgrounds. During Homecoming Week, the university strived to promote this bond through events such as the Alumni Lounge. There, alumni were invited to join together no matter how long ago they graduated. Homecoming celebrations in general are meant to circumvent what Scott Siegel, development director at UM’s central development office, described as underwhelming attendance at more specific alumni events, including milestone-based graduation reunions. Meredith Camel, executive director of university communications and recent Iron Arrow Honor Society tappee, agreed with Siegel and said homecoming is much more inclusive than other alumni events because its geared towards all graduates, as well as current students and faculty. Megan Ondrizek, executive director of UM communications and public relations, said participating in Homecoming with the Federacion de Estudiantes Cubanos as an undergraduate allowed her to become immersed in the spirit and culture of UM. After graduating in 2004 as a double major in print journalism and history, Ondrizek eventually found herself back at the U. Browsing for job openings in public relations and strategic communications, Ondrizek saw a position available in the university communications department. To Viena Perez, an alumna of the Miami Business School master’s in leadership program, a sense of home is only one of the many reasons for which alumni may chose to work at their alma mater. 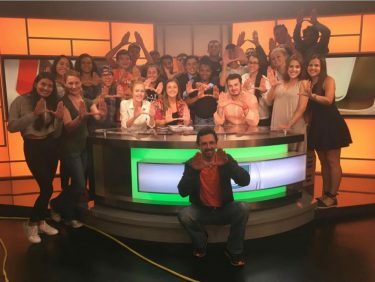 “UM’s beautiful campus and strategic geographical location, further enhanced by the diversity of its community, made the decision to work at the U an obvious one,” said Perez, who is the current director of events in the Office of the President.